"a live-fire test and evaluation, and weapons effect platform"
I love the Navy and its incredible ability to make my sentences look succinct! I certainly understand the value we gain from sinking these former protectors of democracy, but it is very hard to watch them go. I am glad we have preserved the valiant history of a number of these vessels in the form of Museums like the USS Midway, the USS Lexington, the USS Yorktown, the USS Hornet and the USS Intrepid. Future generations need to know the sacrifices men and women in uniform and their families made during times of conflict that comprise our nation's history. And artificial reefs at the bottom of the Atlantic only support schools of fish, not schools of history. But to be honest the fate of the USS America is a damn sight better than what was the destiny of great warships like the USS Coral Sea (CV-43). Think of her the next time you shave your beard in the morning, or open a can of Campbell's tomato soup. This is not the way for the "Ageless Warrior" to go! 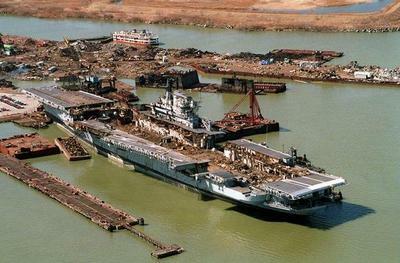 Update (5-26-05): According to sources, after numerous tests and evaluations of damage and blast effects conducted by the US Navy, the former USS America CV-66 was indeed sunk in over 6,000 feet of water off the US Coast on May 14th. am proud to say I served on her. My dad was in the U.S. Navy in 84' to 92' and he was on the U.S.S. Coral Sea and he still talks about the ship like he just was on leave. DAMN SHAME!! BUT LIKE THEY SAID, SSHE WILL STILL BE HELPING OUR FLEET IN THE FUTURE, WITH THE TESTS AND ALL. SAD TO SEE A WARSHIP WITH OUR COUNTRYS NAME GO THROUGH THAT, BUT IT WILL BE A HUGE HELP IN THE LONG RUN. I SERVED ON HER FROM 1991 TO 1995 IN ENGINEERING, 4 MAIN MACHINERY ROOM. HAD SOME GREAT TIMES WHEN I WAS STATIONED ON HER. I SERVED ON HER FROM 1991 TO 1995. HATED IT WHEN I WAS IN, WORKED IN ENGINEERING, MP DIVISION, 4 MAIN MACHINERY ROOM. HOT, NOISY. LOOKING BACK NOW WAS NOT TOO BAD, GOT TO LEARN A LOT OF NEW THINGS AND MET SOME FANTASTIC GUYS. SHAME THEY SUNK HER, LIKE THEY SAID SHE HELPED THE FLEET BY THOSE TESTS. JEFF COSTY COSTIGAN. What a shame.... She served our country and protected our freedom for generations. A little know fact is that the Midway was perceived as the more capable of the three sisters. The FDR was scrapped in 1977 but I wonder why the Coral Sea had three catapults and why they never fitted the Midway the same way. I WISH there was a way to find out what their differences were especially after all the years of continuous improvement. served on cv66 as dk3(sw) during desert storm. cruised the med and the suez. breaks my salty heart to see her go down the way she did but the gains from tests performed will make some much needed advancements in damage control. i cannot believe that she was put to locker years ago and i just now found out in 2008. Haze gray and underway. i miss those days.